Geo-Environmental’s renewable energy assessment has been designed to provide our clients with the most appropriate and sustainable energy solution for their premises or property. This solution may be a renewable solution, such as a ground source heat pump or solar PV, or a mix of traditional energy sources (gas, electric, wood etc) and renewable energy sources. If you are retrofitting a property or premises, you need to ensure that before you install any new heating system, you have good levels of insulation. This will ensure that you do not install a much bigger system to heat your property or premises than you need when you compare it to a similar well insulated building. The cost of upgrading insulation and double glazing is much cheaper options than oversizing a heating system to meet the demands of a poorly insulated building. How can I take advantage of incentives like the renewable heat incentive (RHI)? The answer to this is to start planning now. At Geo-Environmental we can perform a desk based assessment of your premises and identify the next steps that you need in order to successfully implement a cost effective renewable energy system to heat them. 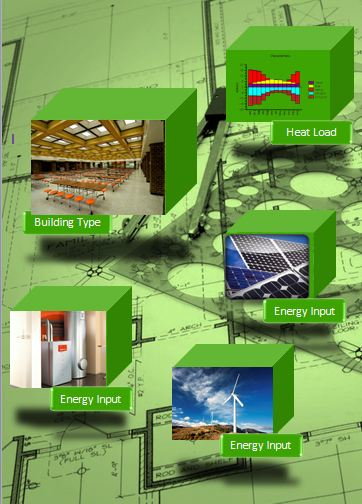 We can identify which renewable options would best suit your property by modelling your building and its insulation levels, estimating its heat load and simulating different types of energy source to meet this heat load.